I’d been waiting for a day like this. I could’ve done with one in June for an adult Club-tail hunt, but for the second year in a row I was robbed of the chance. No matter, there’s always next season. 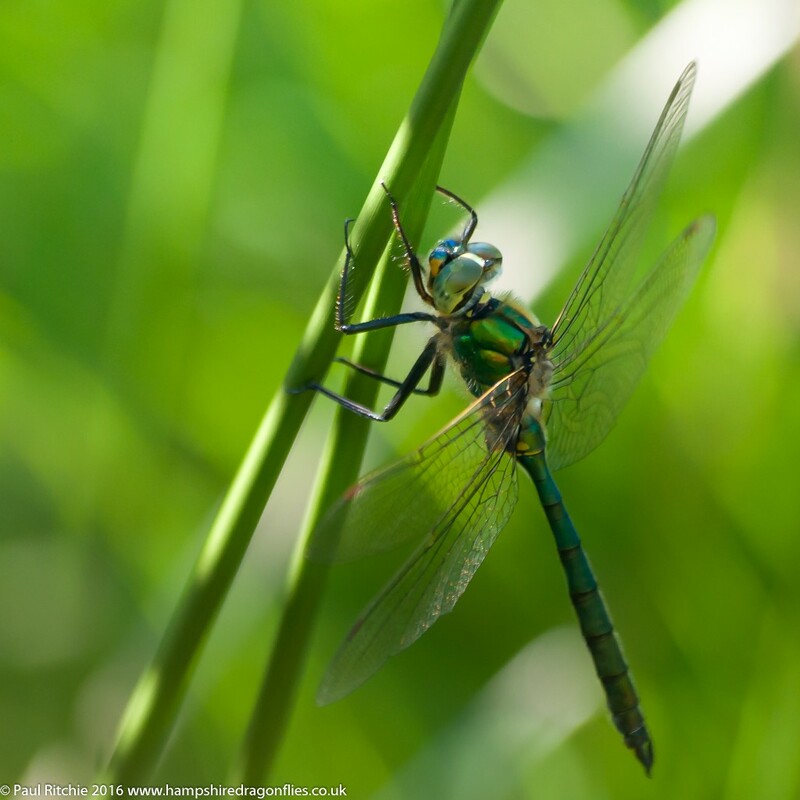 Today however landed within the confines of July and was ideal for a return trip to Ashdown Forest in search of the elusive Brilliant Emerald. I hadn’t felt the need last year as I encountered one at Bramshill, which is on my (rather large) patch. Besides, it is a rather long and fraught drive on a whim. Once you’ve battled through the bottlenecks of Worthing through Brighton you start to feel a little eager to get outside of the cabin. I couldn’t get my boots on fast enough, and too much eagerness resulted in yet another navigational error on the reserve itself. By the time I’d reached the muddy pool I’d done all the walking over rough ground I wanted to in this heat. I love the heat, but I needed my energy and water supplies for what turned out to be a long wait. I didn’t have to wait long for a view, but the resident Emperor put paid to any prolonged visit. While waiting for a reappearance I passed time with the resident Brown Hawker, who was surprisingly predictable, but no less difficult to pin down. 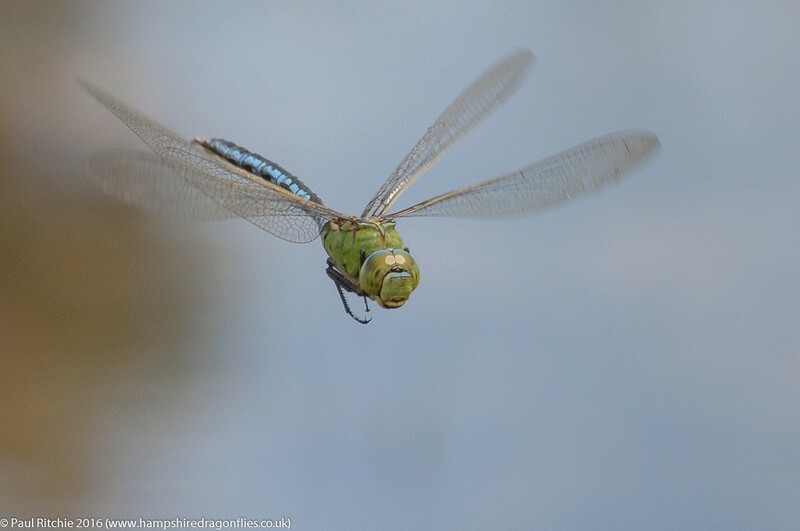 At lunchtime I was left to myself and with the absence of protagonists he reappeared and proceeded to do a few unpredictable circuits, keeping me on my toes frustrated but totally engaged until he flew off upstream. 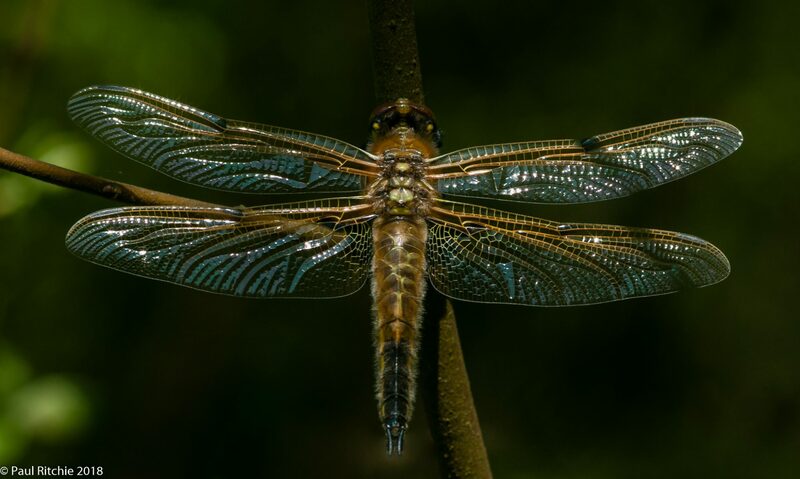 Oh well, back to that Brown Hawker. There is so much to explore here but I needed to retain focus. I did manage a stroll downstream to the fence where a Golden-ringed was holding fort, and a short stroll across the other side on the heath before returning to the pool, fearful I may have missed something. At the footbridge I had my first viewing of a Southern Hawker this season, frustratingly patrolling the dark pool underneath. There’ll be plenty of chances for those later in the season. Regaining focus I patiently waited, nay, prayed for a reappearance. At 3.00pm I was getting jittery, wondering whether I should walk upstream to seek out the remainder of these dozen pools. I figured I could return to the car park slowly and with adventure, but that would mean leaving the pool. At 3.30pm, low on water and weary, I picked up my backpack and threw it over my shoulders, locked the waist strap for the climb and turned to leave when he reappeared, long enough for me to put the bag down again while I desperately attempted an in-flighter to go home with. What happened next will stay with me for the rest of my days. Can you believe it? I couldn’t. I thought I was dreaming, but was savvy enough to turn the camera his way, still on flight mode, grabbing any shot I could before changing to perched mode. I had just 25 seconds before he rose and disappeared upstream. I was elated! I’d waited 5 hours for this opportunity and with a huge grin on my face I put the back pack back on and turned to leave. But it wasn’t over yet. Back he came and I would have been a fool not to have another go. My long wait was rewarded with the appearance of another male and a brief territorial battle ensued before he drove his protagonist away, returning briefly to his patrol before miraculously perching again! This time only for 10 seconds, but 10 seconds was enough because this time I was ready. What a beauty! The long wait had definitely been worth it! OK – now thankfully back online and, most importantly, being able to access my photos, I have a little catching up to do. Those of us old enough to remember the legendary summer of ’76 always hanker after a day or two to remind them exactly what summer is. Naturally the younger generations wish we wouldn’t bang on about it, but then I wish you old buggers would quit banging on about our only legendary sporting achievement of ’66! At least we can repeat 1976 occasionally with beautiful ‘scorching’ days like today; and the savvy can enjoy it in true fashion by avoiding the parks & beaches and associated traffic delays by disappearing into those little wild spaces we have left. Mid-July was the ideal opportunity to get a better perspective on Crockford. I won’t bang on about it any more; you can read through my thoughts by doing a search of the blog or taking a look for yourself. If you had visited for the first time today you wouldn’t grasp what all the fuss was about because thankfully most inhabitants were showing to some degree, albeit in the lower sections of the stream. 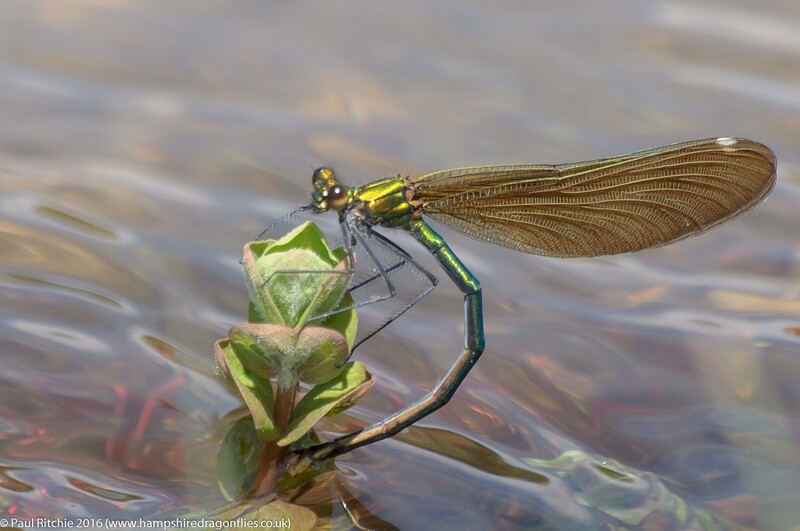 The basin is still sadly lacking, although we did have one Golden-ringed taking up residence along with a couple of Southern, Small Red and Beautiful Demoiselles. 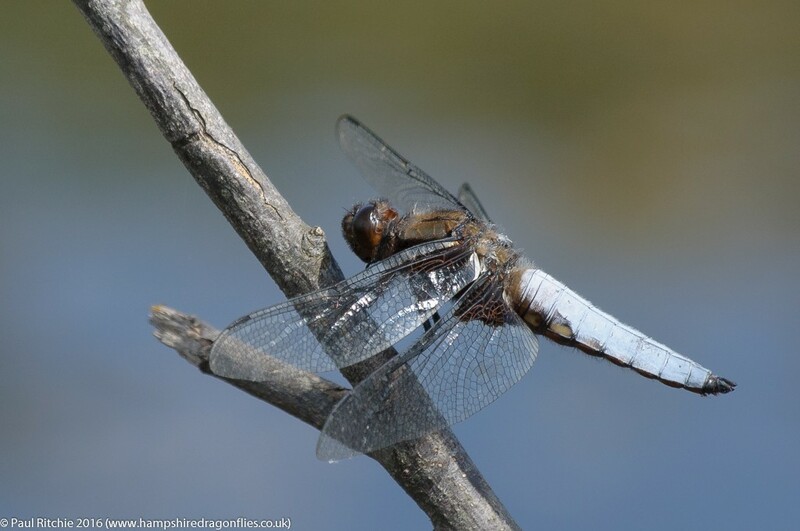 There was even a Broad-bodied Chaser at the pool. Walking upstream there was more of the same, only in better numbers. After connecting with a second Golden-ringed I made my way to the top away from the roar of the traffic to my favourite spot where an Emperor was predictably patrolling the pool at the ford. Further along I set camp to concentrate on a Golden-ringed who by his behaviour could well have been the same individual from my last visit, except this time after a while getting acquainted he settled down a little. 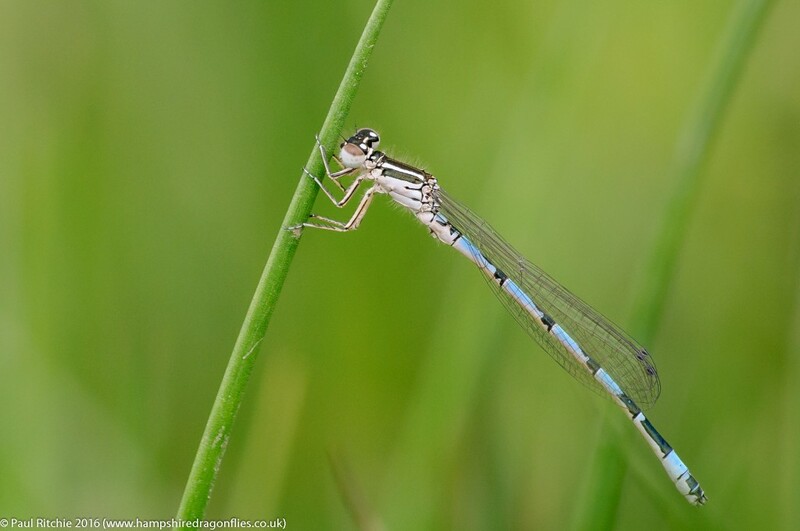 Besides my main subject the stream had the usual populations of Southern, Beautiful and Keeled along with a few Common Darter and another male Broad-bodied. Thankfully my subject had chosen the perfect perch. The wind was light, the sun was absolutely glorious and we even had a few hazy small clouds to cool us down a little. Absolutely perfect conditions to spend a couple of enjoyable hours escaping the rat race. Today certainly wasn’t a day to walk any distance. Once I’d exploited all opportunities I made my way back down to the basin to see if there were any improvements, but the main basin still disappointed. 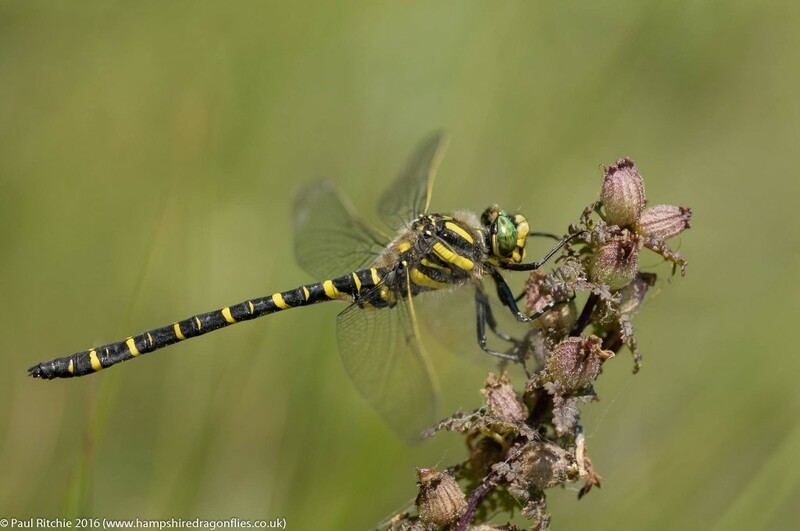 Again it was nearer the road where most of the action took place, with another three Golden-ringed, a fair showing of Southern and Beautiful and the usual numbers of Keeled Skimmer. If you haven’t been before and do want to pay visit, choose a day like today with plenty of sun and very little wind and, if you’re prepared to wander a bit, you should be rewarded. Many of you might think I’m way too busy enjoying the sunshine to update the blog and you would’ve been right up until Wednesday. I’d be a fool not to take advantage of this superb weather and enjoy it while it lasts. After all, we don’t get glorious ‘1976’ summers any more. Some of you still bang on about the glory of 1966 and hope for a revisit, but we realise that being British means accepting disappointment on a daily basis, whether it be the weather, sporting glories or sheer audacity of bottled water. Anyway the delay in updates is due the my PC failing on Tuesday evening and the associated inconvenience. Thankfully I’m wise enough to back up all important stuff like photos, but not being able to view my images, let alone post then online, has been painful to endure. This task alone took time as the notebook I have doesn’t read cards (it should do) so I had to find the USB lead, find a method where I could at least view the images and, as they’re RAW format, try to find a program which could process them. Shouldn’t be too difficult right? It is on a 10 year old notebook with all the speed of a tortoise on tranquilizers. Then of course I had to remember all the login details for various platforms and e-mail accounts. I’m sure some of you have been there, and I have been before when it was obvious my daily routine was simpler. I was also sensible enough to create some daily draughts for blog updates while still fresh in the memory, and I’ll attempt to post these shortly when I have some images to include. In the meantime please bear with me and enjoy yourselves chasing dragonflies while this welcome change in the weather lasts. I was recently asked if I prefer to indulge in my passion solo or with others. Certainly experience has taught me I come home with more keepers if I’m allowed to focus uninterrupted and without distractions. I can concentrate on my subject and the thought that I might be missing something elsewhere doesn’t enter the equation. However having a companion in the field opens up many more opportunities. An extra set of eyes is always useful when there is so much going on. This doesn’t have to be another photographer, just someone who shares the passion and, in my case, has much better eyesight. When I can persuade Sue to get up at a reasonable hour on weekends we can choose a favourite spot away from the crowds where there’s usually plenty going on. While I delve deep into the undergrowth or stay transfixed on a pond, Sue can see the big picture, maybe spotting the route taken by a mating pair or finding something close to hand which is of interest. Bentley Wood is one of our favourite spots where, providing the conditions are right, there’s always plenty going on. The walk in along the rides threw up several roosting immature Common Darters, the odd female Emperor disturbed at our passing and a selection of woodland butterflies to make the walk pass quickly. At the pond today there was more than enough going on but this is a place where the best opportunities ‘happen’, so while Sue stayed at the pond I explored the meadows further, watching both male and female Emperor hawk above the grasses, taking smaller prey on the wing and dropping down with the larger butterflies. 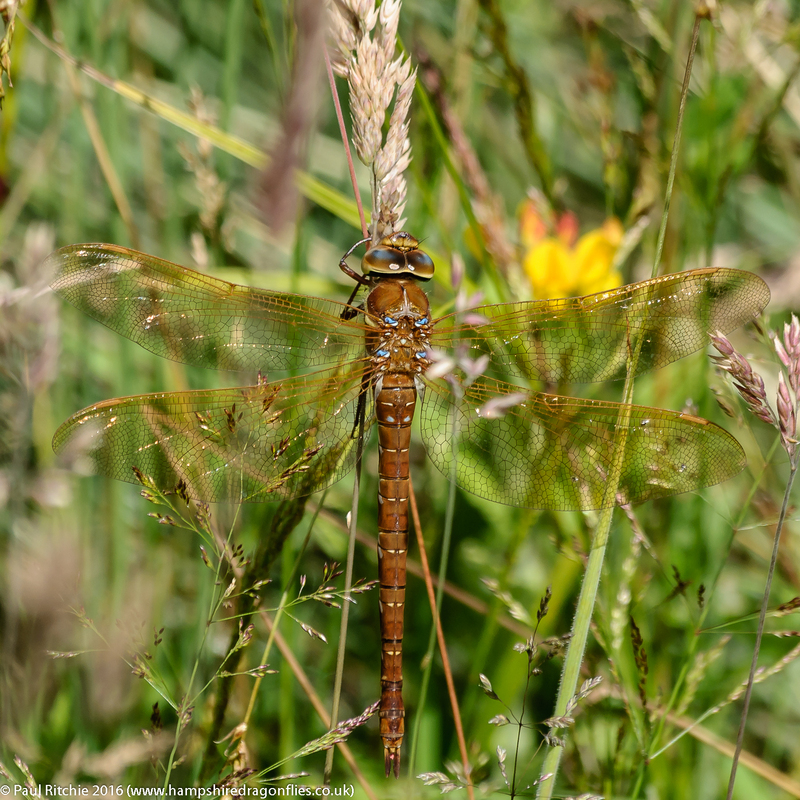 The meadows, like the forest rides, were also full of Common Darters, mostly immature individuals feeding up to full strength before they braved the perils of the pond. 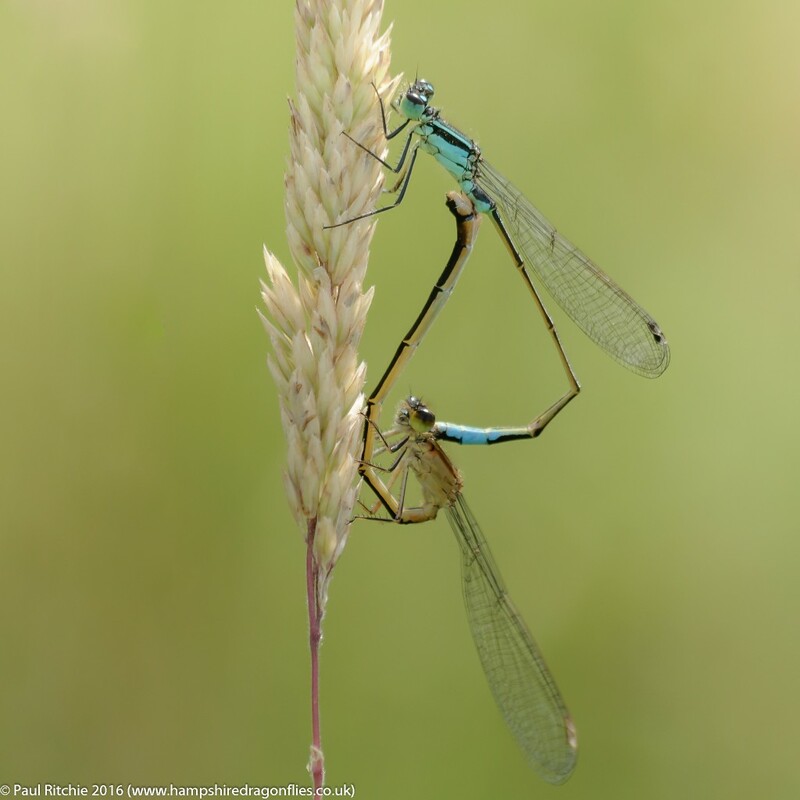 The meadows were also full of damsels boosting up from this healthy larder. 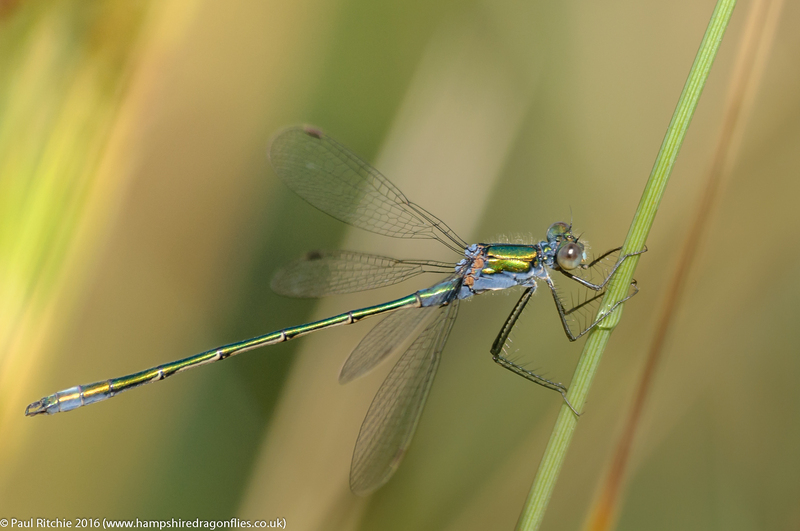 I made a conscious effort to ignore the Emeralds as I’ve taken far to many this season. 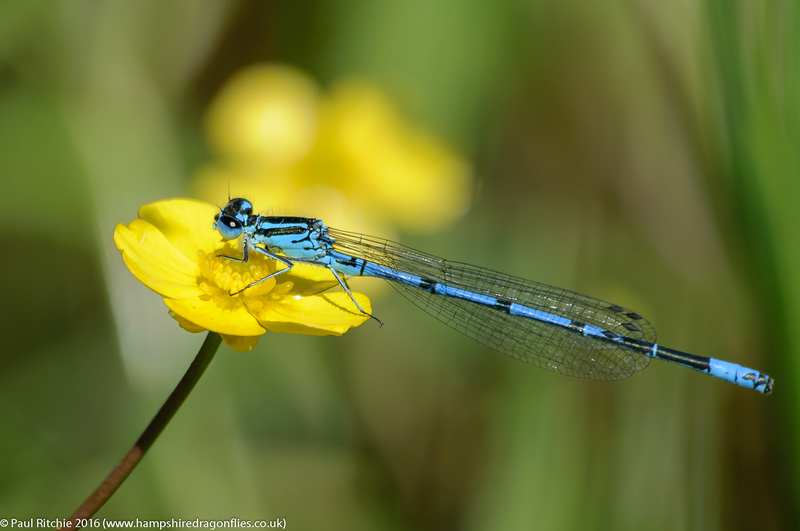 I’d usually ignore the Common Blues and Azures, unless of course they perched pleasingly. 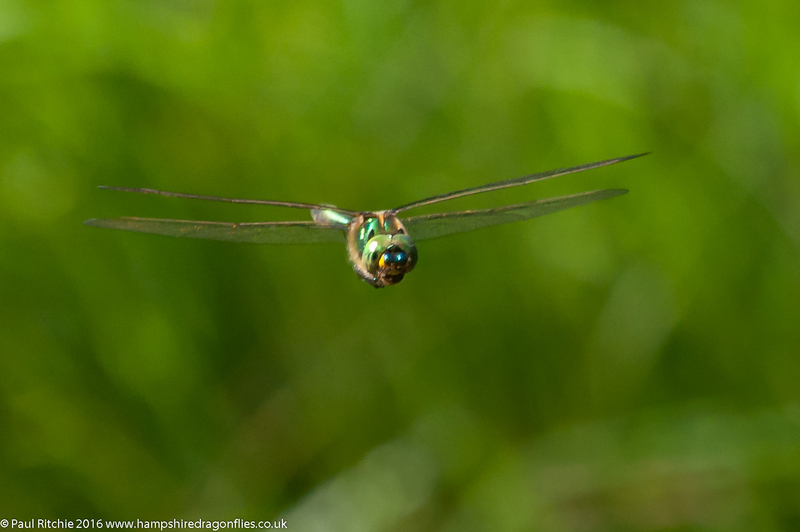 The ‘happening’ moment arrived with a Downy Emerald disturbed by my passing. While I was busy concentrating on yet another Common Darter I could see him in my peripheral vision and promptly switched direction, finding him perched nearby on the bramble. It’s always a pleasure to still see Downy in July and this one was showing his age with the dull, copper tones of his once vibrant abdomen. This was the only one present today, which given the population of Emperor dominating the pond isn’t unexpected. 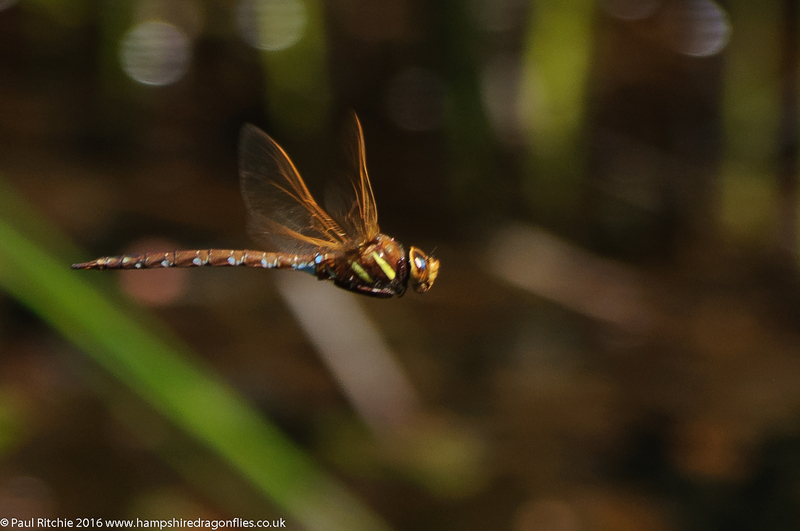 We did have one Brown Hawker come in for a brief look around but with the wind strength and frequent clouding over it wasn’t quite warm enough to bring the pond to its full potential. 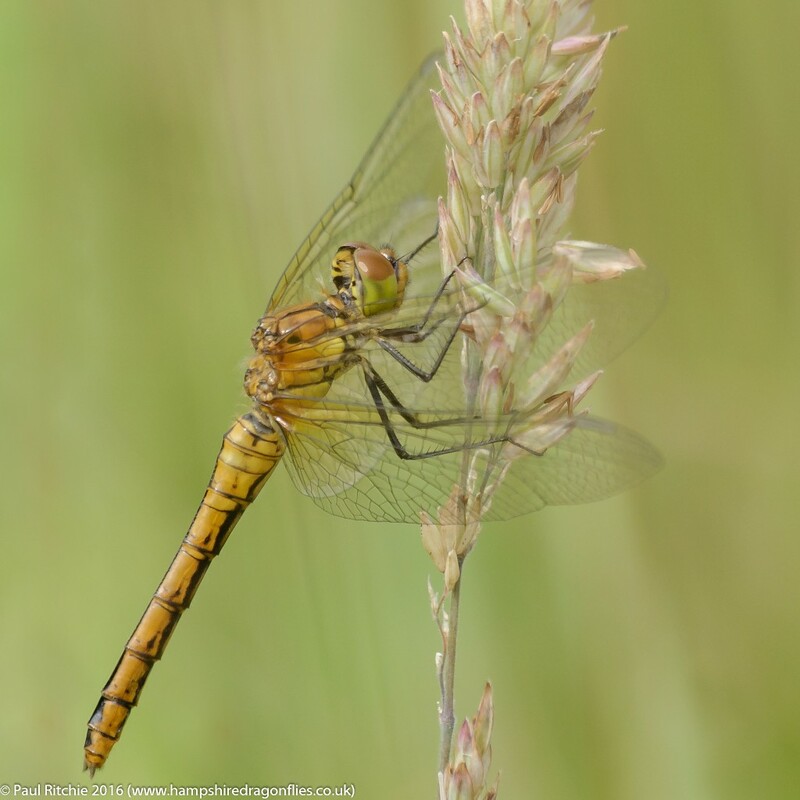 So, another Common Darter then. 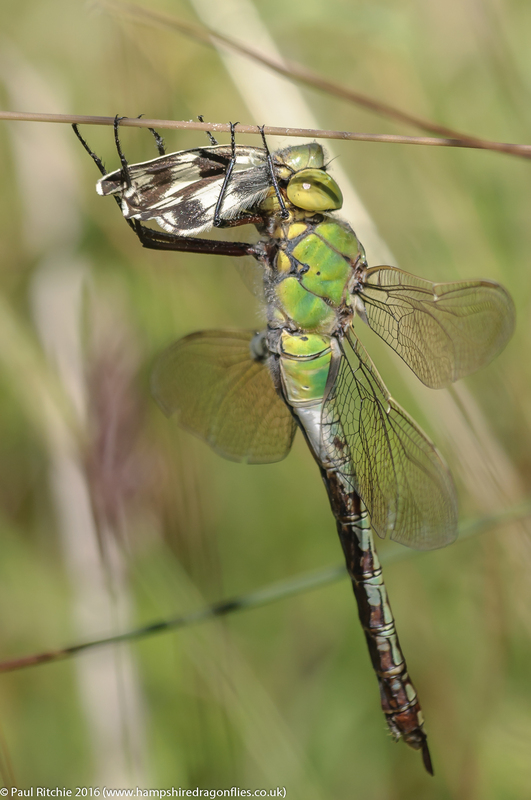 The only Emperor opportunities I had today were distant flight shots or tangled angles deep in the grass, neither of which passed muster, so I finished the day with a Blue-tailed pairing which my other pair of eyes had noticed. Three days in a row out in the field? Must be summer, right? The problem is we’re still yet to experience the true benefits of a ‘good’ summer; warm, sunny days and calm winds. Still, Thursday wasn’t too bad and at least allowed me the pleasure of a good walk along Ober Water and an insight into a yet unexplored area of the New Forest. Dames Slough Enclosure follows an upper section of Blackwater above the A35 and has the potential to offer the same environment and species as Ober Water. The closure of car parks several years ago renders access a little more difficult than it was, but if you’re prepared for a little walk along an old forest track you will reach the Blackwater Bridge. 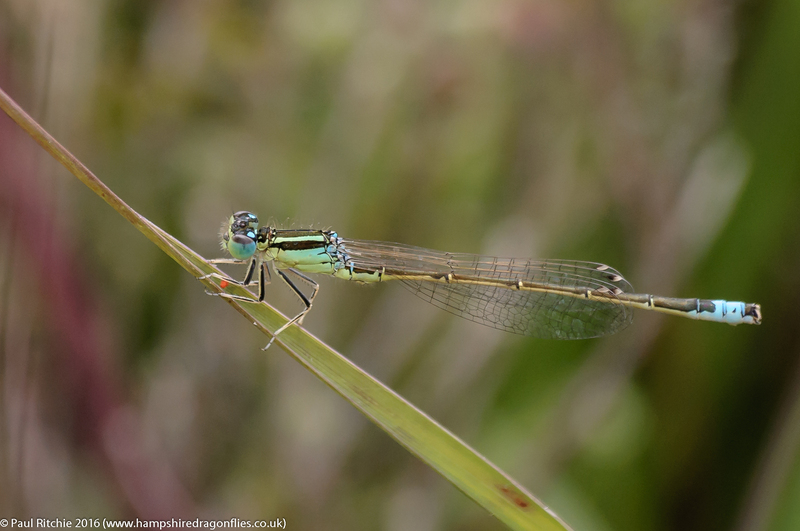 Once you crossed the stream it opens out into a boggy pasture where grasses and scrub provide suitable shelter for resting odonata. 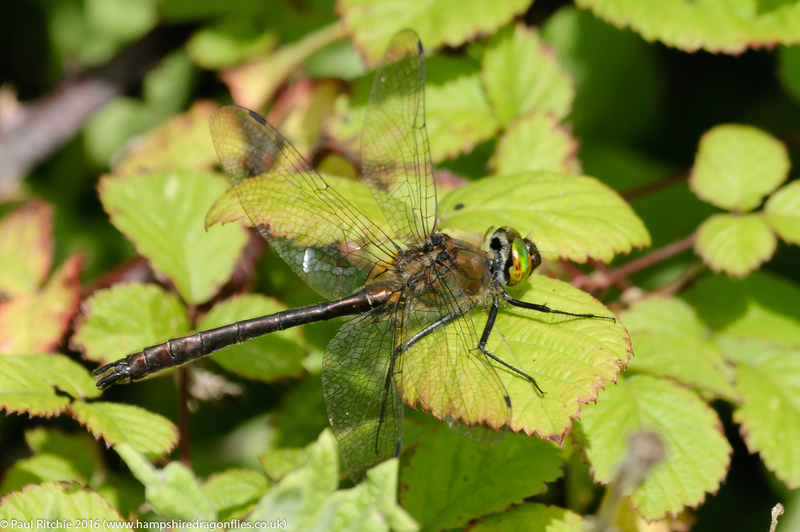 In fact the very first species I encountered was an immature female Keeled Skimmer, but by far the most prolific here were the White-legged – previously only considered to be along the Ober. The ferns and grasses held more than enough to keep me amused. 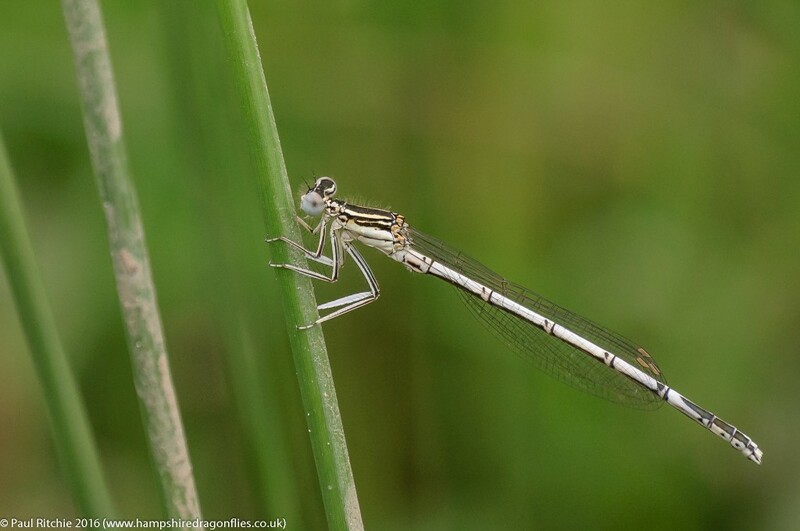 A few more immature Keeled rose and repositioned while a small showing of Beautiful Demoiselles fluttered over the water, but I couldn’t resist those White-legged. Once I had my fill I walked upstream as far as the terrain would allow, taking note of some boggy areas across the stream. I did spot a Golden-ringed heading into the gorse scrub but despite my best efforts I couldn’t locate it. This is certainly a site for further exploration. Satisfied with my visit I drove the short distance to Ober Water, this time taking the path above the stream along the treeline. Several more White-legged present and a few Keeled Skimmer and Common Darter. 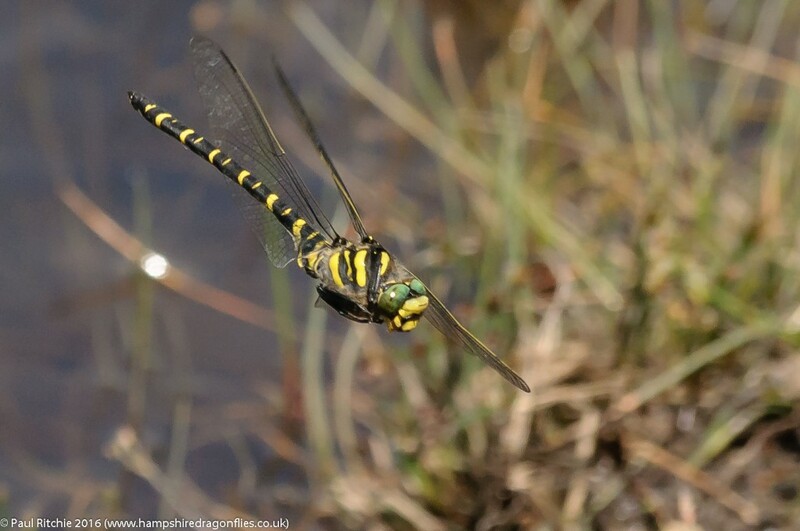 Not the Southern Hawker I hoped for unfortunately, but there’s plenty of time for those. 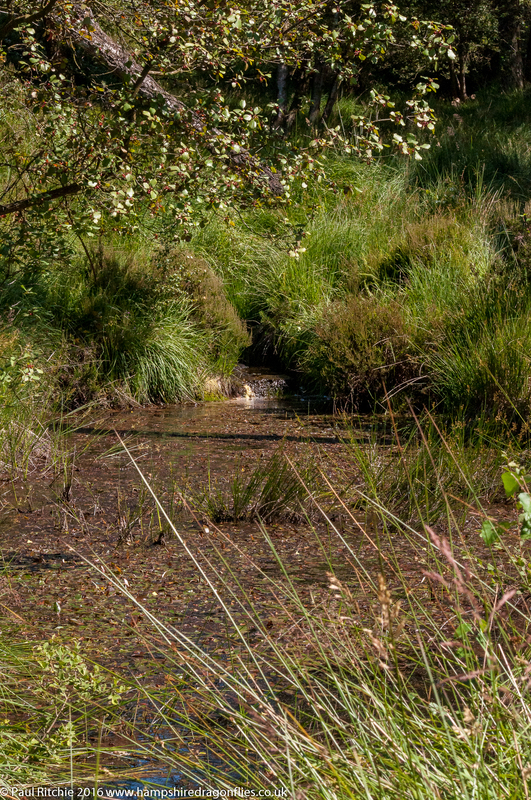 The grassy areas bordering the stream played host to more White-legged while across the stream the Small Red were populating their favoured Bog Myrtle. 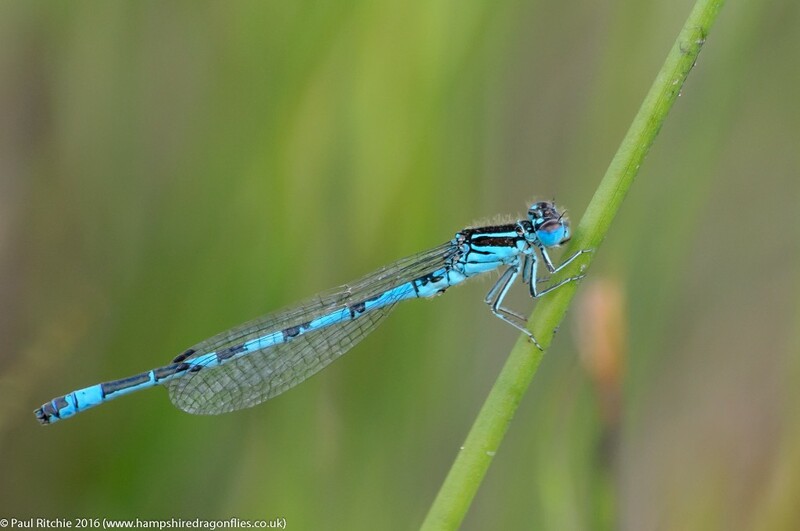 The heather held a few Silver-studded Blue and the expected teneral Keeled Skimmers while along the stream itself a few Beautiful Demoiselles were dancing above the Southern and White-legged. Despite the lack of sun a lone male Keeled Skimmer made an appearance. So a new prospective playground and a very familiar stroll along my favourite New Forest stream. Ober Water has to be one of my favourite walks anywhere. The peace, tranquility and bountiful wildlife will keep drawing me back. 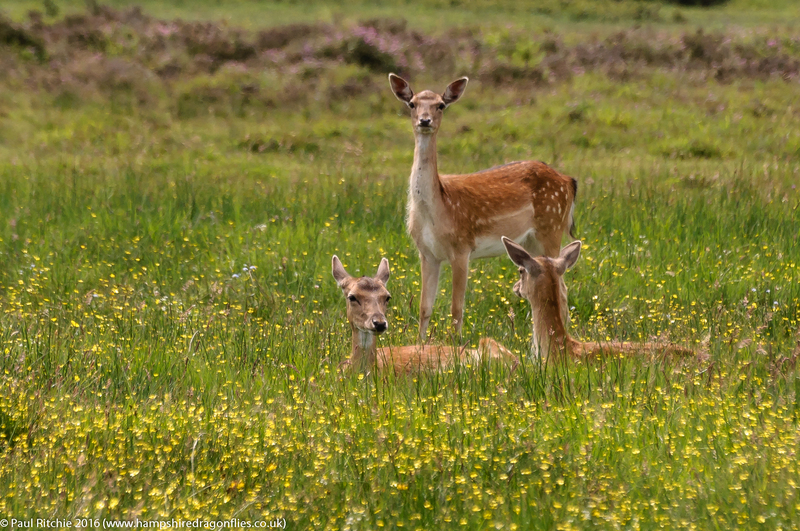 Fallow Deer relaxing in the meadow. I finally struck up the courage to revisit Crockford Stream after witnessing the horrors early in the season. Despite my reservations and protests all I received from the BDS and Natural England was an assurance that all will recover for the better. 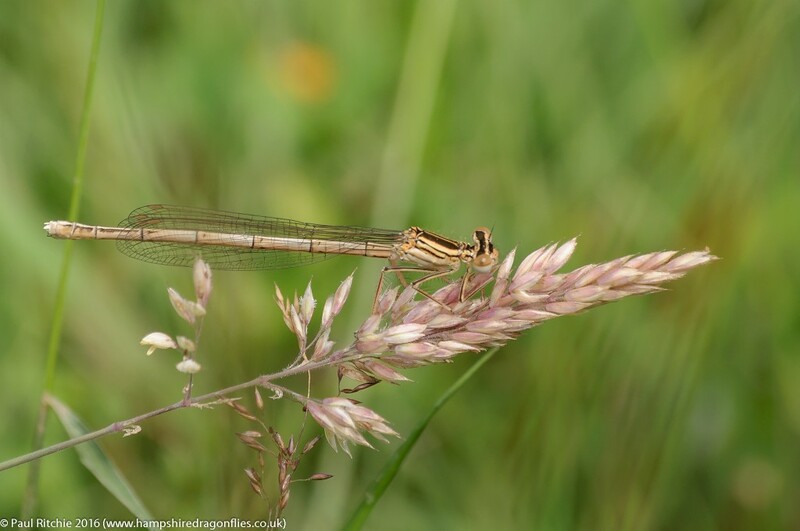 In early July you should expect to see a good showing of Golden-ringed, Keeled Skimmers, Beautiful Demoiselles, Southern and Small Red damselflies all vying for territories along the stream. At the ford this time last season all were present in good numbers. 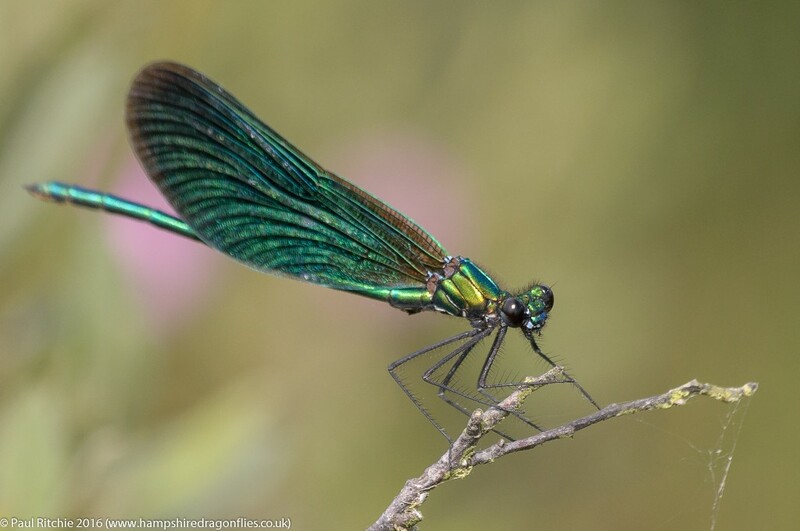 In the channel protected by the small thicket of gorse and heather you should be able to witness Golden-ringed and Keeled Skimmers jostling for position among a few Southern while Beautiful Demoiselles dance around them. The Small Red tend to congregate around one of the many Bog Myrtle bushes a few meters upstream. Not one was seen today. A few metres further is an overhang above a deeper channel where the Southern procreate. Not one was present today. The heather, which thankfully is still present to the north of the stream played host to many feeding and resting individuals. 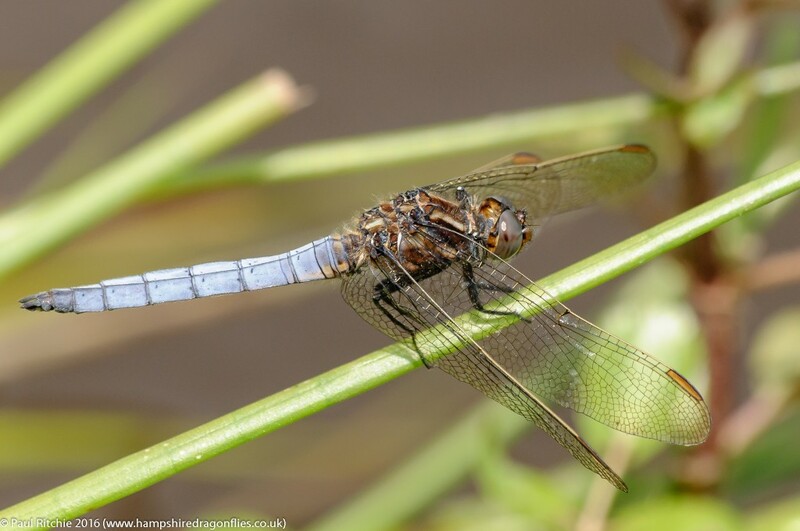 I only managed to flush just one teneral Keeled Skimmer today. Disappointed but not surprised I decided to head upstream to a favourite little section which so far remains untouched. It was here I finally saw my first Golden-ringed, rising at my passing to proclaim his territory back and forth along this narrow channel, battling briefly with a passing Emperor and disturbing a few Southern. A few brief moments of sunshine had raised the temperature enough to hopefully awaken the basin back downstream, but despite a last desperate search I found nothing to engage me any further. Instead I headed across to Latchmore to see if things were any better, but the heavy watershed recently has rendered the main channel devoid of any action. 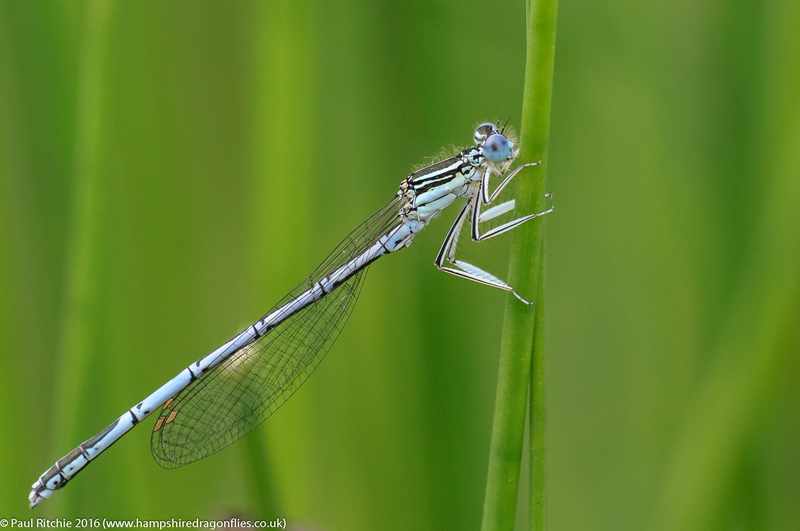 Reaching the flushes I was eager to see if they could provide a better spectacle but it just wasn’t warm enough to coax the Scarce Blue-tailed from their reverie. 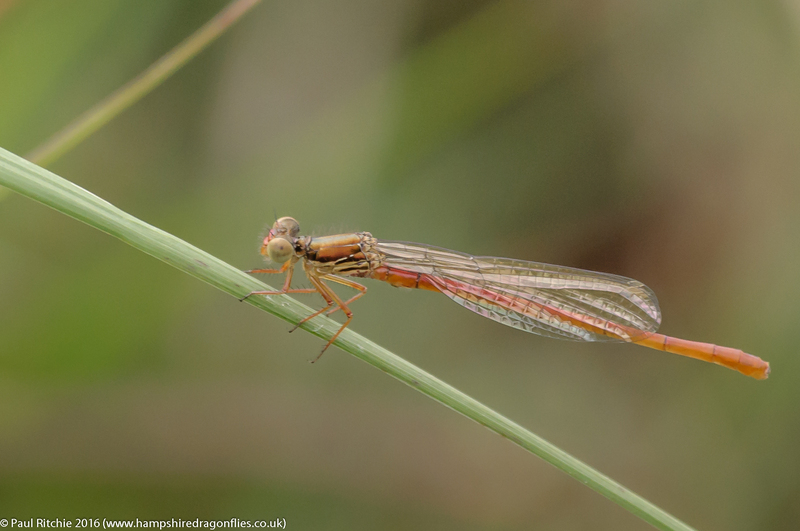 As is usual in such conditions you’re likely to find more damsels hiding out among the heather and grass, and sure enough there was a good selection of male and female Small Red. 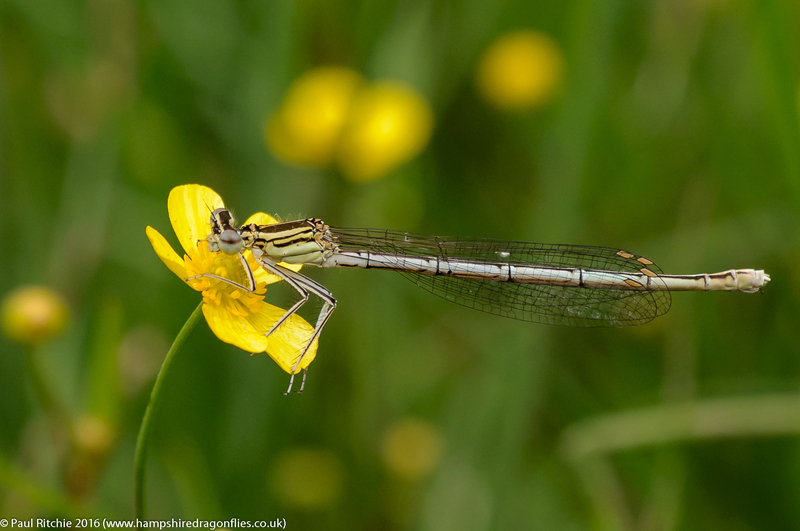 The lack of immature Scarce Blue-tailed indicated that the main emergence had passed, although I did find one aurantiaca phase female, a couple of mature green females and a few males hunkered down. A disappointing day then, but not every day is rosy and full of opportunities. That said there should have been more than enough at Crockford to keep me entertained for a few hours, but it’s obvious that the work has effected the odonata populations for this season. I will pay another visit towards the end of the month to see if there are any improvements. I sincerely hope there are. I need my mind putting to rest. Those of you who are familiar with the delights this stream can bring in July should pay a visit and see the difference for yourselves. Sue & I took a trip to Bentley Wood with a few hopes & wishes. Maybe a Southern or Brown Hawker patrolling the rides and the possibility of some Ruddy Darter at the pond? The Emperor were certainly in attendance, this female providing the first opportunity of the day feeding on an unfortunate Marbled White as we strolled through the meadow. 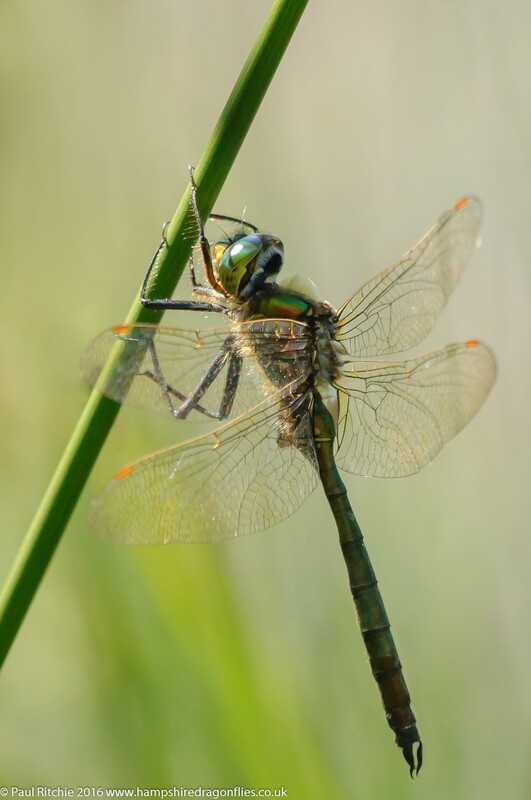 In the (very) brief moments the sun made an appearance we had a couple of male and a female Emperor over the pond, a lone Broad-bodies Chaser, a couple of tatty Four-spotted and a few Azure, but by far the most numerous species here today were the Common Emerald. 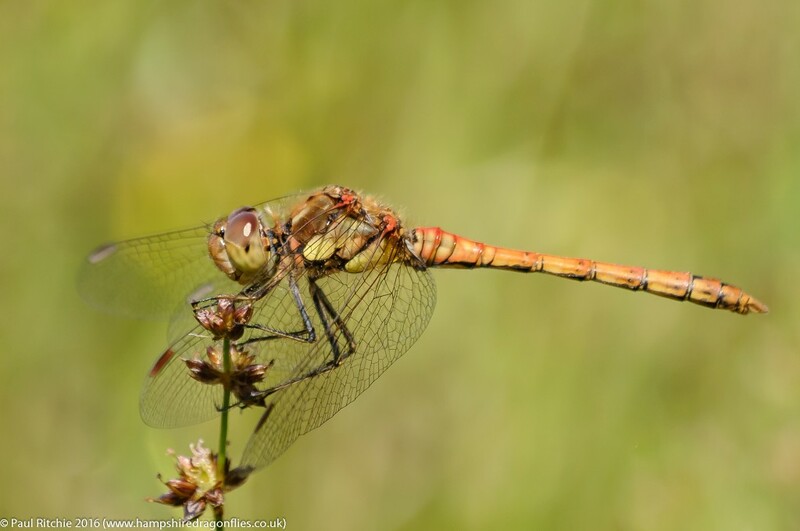 We did notice quite a few teneral Ruddy Darter disappearing out a reach, so there was one off the checklist, and a couple of fresh Common Darter, which was to be expected. We could have done without the couple of heavy showers though! 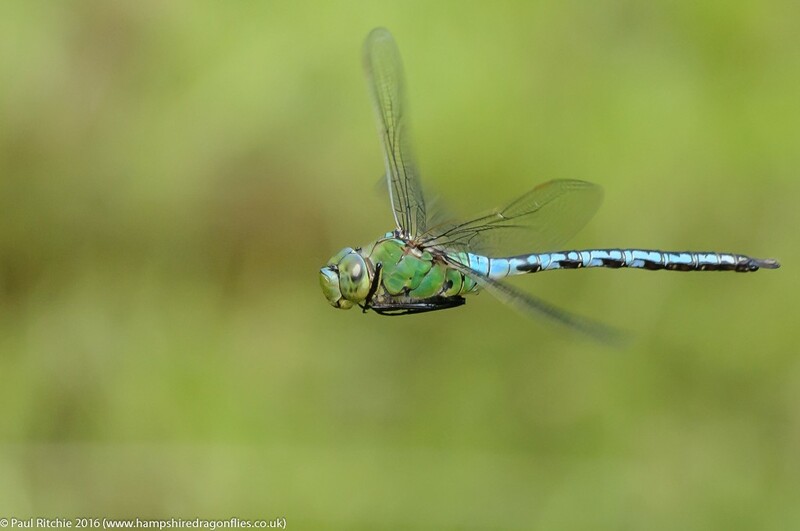 Despite non-optimum conditions and an over-abundance of Emeralds we did manage another from today’s wish list. 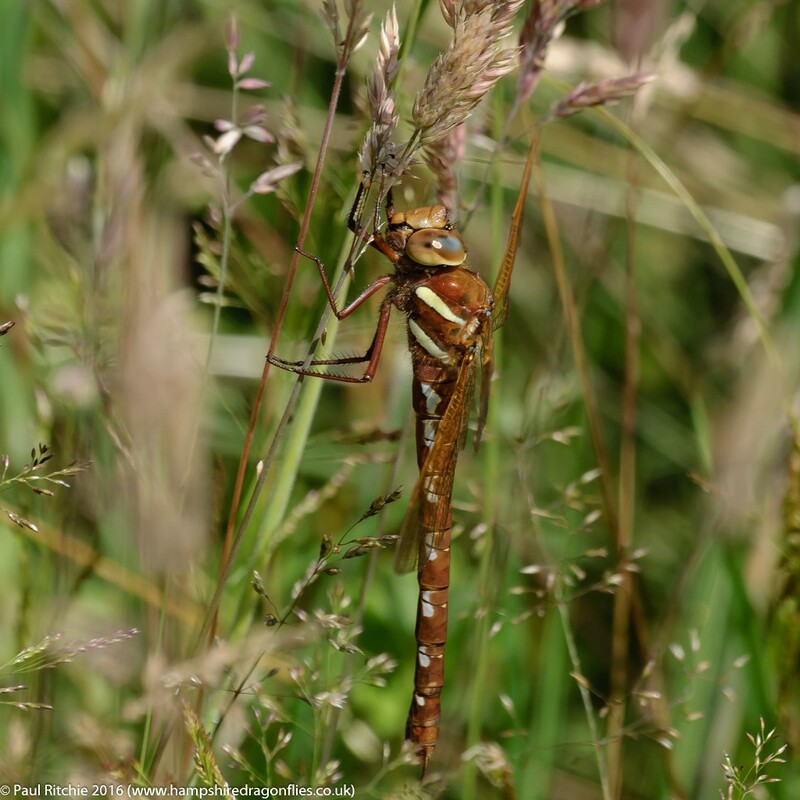 A female Brown Hawker was spotted by Sue hawking the meadow. 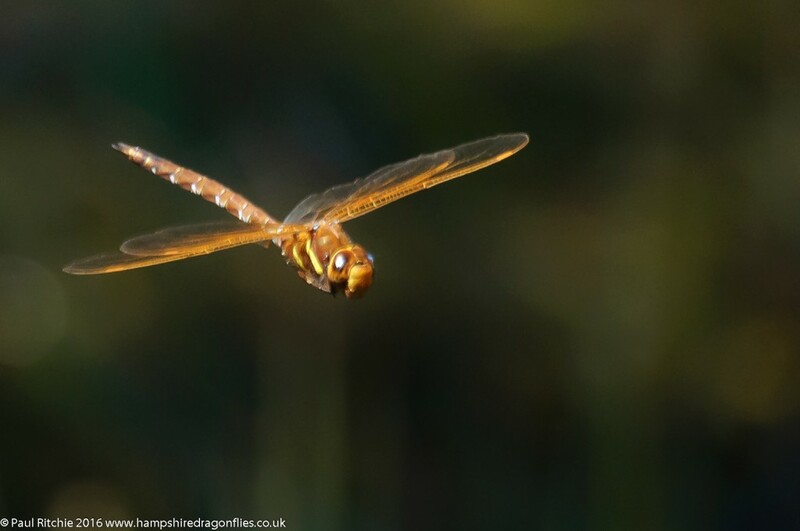 As she dropped to feed Sue called me over and we carefully tried to locate her, but in true Brown Hawker fashion she spotted us first and was up and away towards the treeline. Then quite unexpectedly she turned, circled several times and dropped again some metres away. Having been given another chance I pushed my stealth to the limits and found her obscured by the grasses. With a profile shot (hopefully) in the bag I edged around searching for a gap in the grasses to get those beautifully-fresh amber wings in shot. Shot of the day then, and after a few more attempts at the Emeralds we counted our blessings and called it a day. It’s been the best part of a month since I visited Bramshill so naturally I was hoping for more than a few surprises. Again far from optimal conditions with mostly light cloud forming a blanket with very brief sunny intervals. A welcome sight of a Brown Hawker hawking along with an Emperor boded well, but we needed the sun. I deciding to embark on a quest to seek out a pond which has so far eluded me. Worth the effort? Only in the sense of achievement as it’s long been overgrown with reeds to render it almost useless. A walk along the rides offered tantalising glimpses of Brown Hawker and Emperor but not the hoped-for Southern. At Long Pond it was great to see a tatty old Downy hanging on in there with the usual, but I had to wait until I returned to the ponds for my best opportunity of the day. Despite a five mile walk the lack of opportunities meant this was one of those rare occasions where Bramshill failed to deliver. Thankfully the Emperor saved the day.